Titus Fireline Ti 29 Evo.. This topic has 974 replies, 0 voices, and was last updated 1 month ago by Poopscoop. Worth a try, will report back when fitted. Fourth outing today, and I’ve almost got everything set up perfect. Burly build with 140 mm Pikes, Flows, reverb and Vault pedals. 70mm -6 deg stem and flat 760mm bars. Originally had some 120mm Rebas and some Crests on it but this suits the aggro feel much better. Might try going back to the external lower cup again as having tried it with the Pikes I liked the extra slackness ( but not the bar height ). 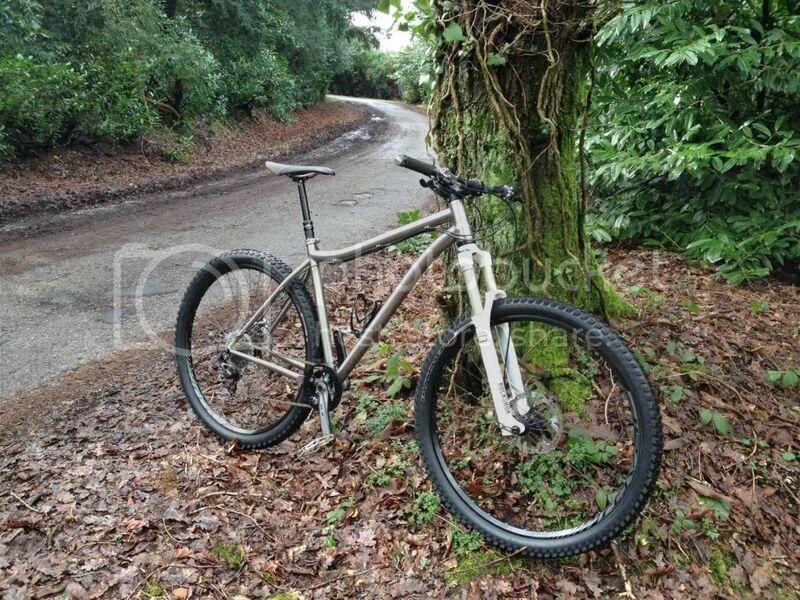 Very pleased with the ride, excellent sprightly climber and a very confident descender, a proper all rounder. One thing that not many people have picked up on so far that needs mentioning is the strange feeling of the front center shrinking when you stand up and stomp. The bias is to enable seated climbing and if you like to be out of the seat allot you might find the bars feel too tucked under you. This surprised me on the first outing, but a few cockpit changes have got it almost under control. Where did you get the lower cup from in the end? Is it a boat anchor in weight? Halfords, FSA Gravity 2 . no heavier than the Smoothie Mixer it replaced, probably a touch lighter. Cheers. I might invest in one. I know 140 is probably more than enough but I’ve seen a few set of pike dual position airs (150/120) and I really fancy the idea of the bigger stations but not sure if it’s one step too far?? Thinking of xt build with xo trail brakes, Renthal bars, hope bits & hope hoops on stans flows. I used to have a C456, and now have a Fireline. They are a similar style of bike, but the Fireline has the29er advantages added in too, and the Ti frame gives a much suppler ride than the harsh C456 IMHO. I run mine with the 120mm Manitou Tower Pro, which also comes in a 140. i’m also 100kg fully kitted out. I came from a ti456 which wasn’t d h.too much of a change. A mate has the c456 tho and has just gone to a soul and reports how the steel is much less harsh. I’ve (slave) fitted some pikes and they looked and felt great the front end gets a bit high. They were earmarked for my new Spider tho so went to the new bike. Comfort is the main reason I’ve been thinking about a change from the c456 to be honest & that I’m likely to be working in Abu dhabi for 2-3 years. Most of the riding over their seems to be generally harsher than it is here but with plenty of long winded climbs and I may be using the bike to get around a little bit. Just unsure if it would be better to have the dual position 150/120mm set and then get some flat bars to lower the front but should still be great for climbing???? Think fox are too expensive and their 2013 damping was crap. Aye the Ti456 definately had a level of comfort when I first rode it. the 29er wheels of the Fireline then took that on a level when I moved to that. So yeah for a Hardtail its pretty comfortable. Aye the pikes are very good. Like mine a lot. However managed to pick the x-fusions up for £230 lightly used so quite a saving so it’ll be good to see how they compare as I get them both more dialled. I’ve never been one for dual position forks… can’t seem to cope with the albeit minor changes in Geo and just more to go wrong for me anyway. There is the FSA Gravity Headset mentioned above if ya wann drop a bit more height of the front end too! Keeping in mind we’re different heights… I did ~8 rides with a fox float 140 on mine, then dropped the fork to 130mm and liked it better immediately. 120 might be even better. For one thing, less travel reduces what my buddy called “the stapler effect” of long travel hardtails. Also the fireline has a decently long head tube, so even with flat bars the front end feels tall with a 140 fork. 130 with flat bars feels good. I kind of like higher front ends and slacker head angles coming from a more dh/fr background but at the same time, don’t want it to be a pig to climb. Reading up on the pike rct3 it looks pretty easy to add spacers to alter the spring rate and at the other end, alter the travel which is cool because it would allow me to play with it to find what feels right. The only problem is I can’t seem to find any shops selling them in white and not a fan of the all black look. Also, anyone had any experience using a 10mm axle on these frames? Like the superstar 10mm qr and bolt through hubs to match? Read a bit about them stiffening the rear up in a horizontal motion, ie less of that sideways flexy feeling. Be careful with the pikes as you need new air springs (£30 ish) to adjust the height. The springs aren’t very available just yet either. The pink bottomless tokens seem a good idea tho to tune the curve. Not got to playing with mine yet. The trace forks I mentioned have a shorter a2c height than other forks so keeps the bb lower (& bars) for a given travel. The Trace’s also have a pin and ladder setup internally so can easily be played with to try different heights! (at no cost if your reasonably handy). Running a dt rws on the rear of mine and fits fine. Seems nice n stiff but again I carried it across from the ti456. I think the white is DPA only. I hear you- my background as well. with a 140 fork the head angle sits around 66.7… for 29’er thats very slack. I found with the flox float 140 this resulted in pretty bad wheel flop while trackstanding on level ground. Not a problem I had with the 140 fork on other 29’ers (kon Honzo, yelli). It’s not just the head angle, longer fork also raises the BB etc. what bugged me more was the resulting change in head angle as the fork goes through it’s travel. Charge into a g-out corner and your head angle changes ~5 degrees… too much! What i like about the shorter fork is that it keeps the handling more consistent thoughout the fork travel. Anyways it’s a subtle thing but just dropping the fork 10mm was a big improvement. I have a pike on my other bike (banshee prime) but I sort of like the fox on the fireline since it’s easy to change travel. Also added a through axle on mine (sunn ringle charger pros) Not a huge difference but everything counts with stiffness. I like the fireline so much I got carried away last ride and dislocated my shoulder… so it’s waiting for my recovery. Is there an chance on some picks of your bikes Gee76 & emailsucks98?? Would quite like something I can change down to about 130mm travel so don’t mind buying other springs if they arent too expensive. I run some 36 kashima talas 180 rc2 forks on my canyon & love the travel adjust feature, hence why I was thinking of these dual position air pikes. 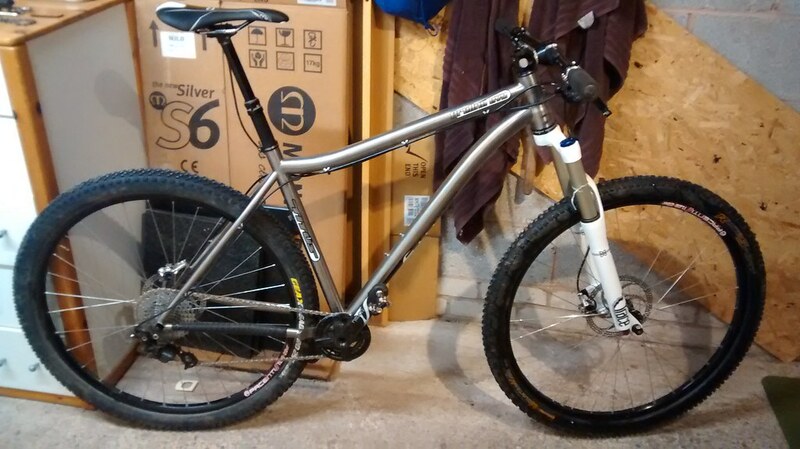 I’ve seen some 2013 34 floats for around £600 in freeborn bikes which would be easier to adjust but if I’m right in thinking are heavier and longer a2c so no good really. it’s got a 140mm Revelation on it at the moment, but I really don’t like how it feels. I have a 160mm Pike off my Enduro i’m going to shorten to 120 for it. Trouble is the steerer is pretty short at 180mm. That’s too short with the current external lower cup, I reckon with one of those FSA headsets it should just give me enough steerer out the top for the stem. I really like it, apart from the fork, which feels like turd. Cracking looking bikes and think I like the white coloured forks better. Hob nob- what is it about the revelation that you don’t like? Have you weighed your fireline hob nob? Looks a very similar build to what I’ve been planning. My 456 carbon is 25lbs all in but I’ve seen quite a few on here at a very similar weight. Is 26-27lb a reasonable estimate with pikes, hope hoops flows and xt single ring etc? Mine is pretty much 25lbs as it is, although a parts bin special, it’s all light parts. The Pike is less than 100g extra in weight than the Revs, I think the wheels you will add a fair chunk on, but i’d be surprised if it was more than 26-27lb. Selling your fireline – could be interested (along with many others i’m sure! ), can you say what size and how much? Pikes RCT3 150mm were 1900g bang on. That’s 75g more than my Rev RCT3 with 20mm maxle (both black). Well worth the extra weight for the performance. Only one ride on the Trace’s so was playing around with air settings still but so far pretty good and fuss free. Minimal settings to play with (so could be a good thing depending on your point of view) but so far they just work. Massive range of rebound adjustment, Plenty of support in midstroke, stiff plush all the things you want. Can’t comment on recovery/composure in real choppy section as yet. I need to ride them a bit more (and the pikes too) to form a thorough comparison but so far I’d say they’re pretty close on performance for my usage. All up mine was about 24lb, but I’ll do a check when i get a mo as the setup has changed a fair bit. the frame is immaculate with no scratches or damage or marks. I’m 5′-9″ and went with the 18″ based off the reach #, which I’m very happy with. It’s still more compact than a medium yelli screamy and a 150mm dropper post fits for me. Only the headtube is a bit long but that was an easy fix with the chromag flat bars. Since these photos I’ve upgraded some parts since I like the bike so much. XO carbon cranks with a wolftooth DRM chainring, Specialized purgatory 2.4 tires, 150mm KS dropper, TA rear axle. I also have a wolftooth 42t cog I’ll put on soon as the shoulders ready (2-3 more weeks). Pics were with the fork at 140mm. Of the AM hardtail 29’er frames I’ve owned this is by far my fave. Only custom geometry could make it fit slightly better for me, since I’d prefer a 17″ ST with 15.75″ Reach. Otherwise I love the geometry- the chainstay length, head & seat angles and BB height are perfection. Thanks for the pics and I think your review emailsucks98 is about the most comprehensive out there. The new pikes seem to be the fork to go for and the 140mm rct3 are 8mm shorter axle to crown than the fox 34’s. Out of interest, spoke to TF Tuned this morning & they confirmed they could drop the travel in 10mm increments but it involves re-machining the air shaft for around £60 but obviously if you wanted to go back to 140mm then it would need a new air shaft. Pretty fair I think. I did ask if there’s much difference between the dual position and solo air & they confirmed the solo air is the better performing fork if you can live without the travel adjust. What are you guys thoughts on tyres? Might have to try and get some more hope parts on there yet, lol. Think I’d hang off until the official springs arrive. Won’t be long. That way you have two springs for £30ish rather than one at twice the price. You can get them from the states if your really keen too! Check eBay.com. Oh yeah I also noticed a rare white pike single air on eBay at £450 too if its still on! On the Pike- I have the 150mm solo on my Banshee Prime and have a 160mm air shaft waiting for installation. swapping the air shafts doesn’t look like too much more work than putting spacers into the fox, but I’m not sure rockshox makes a 130mm/29″ air shaft. the 160mm airshaft was about $30usd. Who knows though, with the shorter length of the Pike and the right headset, maybe it would be fine at 140mm. The pike really is an awesome fork- I’ve had mine since august and it’s definitely a cut above. Tires- I’m a huge fan of the specialized butcher front / purgatory rear combo- at least for Pacific Northwest / BC conditions thats a winner combo. I’ve a Purg too for muddy and rough days (great tyre) but running a conti mk2 2.2 BC rs upfront. Thought it’d b a bit frail (585g) but so far its OK for my riding. 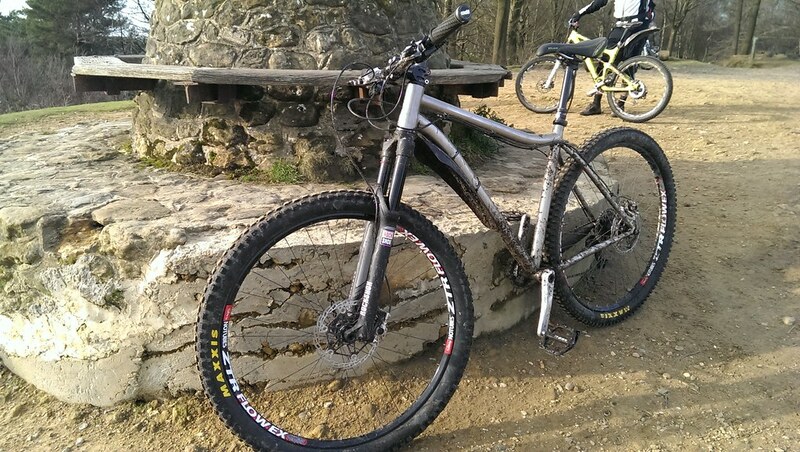 Survived garburn a couple times… I’m pretty light on front tyres tho. On the rear I’m a bit heavier so running a Saguaro. Great tough (700g) fast roller and muddling thru the odd bit of deep mud OK so far this winter. About to build up a couple of light bicycle carbon wide rims 35mm shortly so interested to see what that does to the tyres. Thinking I may be able to move to slightly lighter 2.0 & 2.1 tyres… Or just reap the benefit of the larger volume of my current 2.2s on the ht. I run a Butcher/Purg setup on mine (well, to be fair the whole wheelset is straight off my Enduro). They are pretty good – i’ve used the Butcher before, so know it’s kinda like a faster rolling, slightly less grippy Minion, which is fine for what I use the bike for. A lot less grip on an HT in general though. Thats taken me some getting used to. Well that’s it, I’ve joined the club now. Picked up my 20″ Titus Fireline ti frame from on one today and bought those RS Pike solo air 140mm in white off eBay (new and never fitted to a bike) so feeling pretty smug atm. Ordered my hope hoops on stans flow EX and hope headset. Still none the wiser on tyres tho??? Same story with maxxis ardents? Anyones thoughts on on one tyres? Good man, another Buddy of mine has just made the leap too. Nice combo too. Ive so far stuck with something grippy up front but as you say you can get away with something a little less draggy on the back. I’m considering the Michelin Race’R for a rear when stuff dries out. 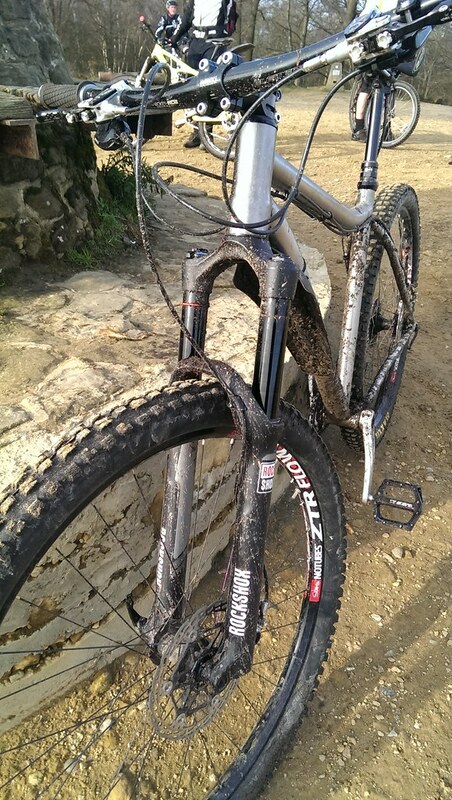 Currently running Smorgasbords front and rear – good grip, even in mud, but not exactly fast rolling. I’ve been thinking about some specialized captain tyres as I always liked the fast rolling ability plus they are a lot cheaper than maxxis and still nice and light. Also what size rear tyre will fit into the rear tyre?? I’ve been reading good things about the maxxis ardent, especially in the 2.4 width. My Saguaro 2.2 comes up at about 57-58mm wide on pace to tl28 rims with a 23,mm inner dia. Still plenty of room at the sides. Can’t wait to see how big they come up on 30mm inner dia rims!. 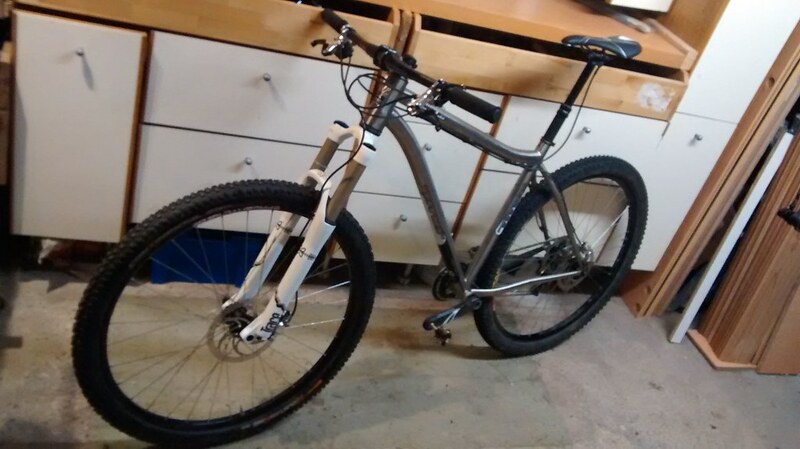 I run captain 29er tyres on my fully rigid ss inbred. I find it a great alround tyre with loads of grip and very fast rolling. I only change to something bigger ( conti rubber queens) for superfast days, like last weekend at Bike park wales. Great value too. Doh darn phone autospell… That was on pacenti tl28 rims!